Liz Earle is a brand that's very well known and loved in the beauty industry for their skincare products - particuarly their famous Cleanse & Polish. Now I have to be honest when I say I didn't get along with their skincare products as well as I'd hoped. Its not that they didn't work effectively or were unpleasant to use, they just didn't work for my skin personally. I have uber sensitive skin and I'm guessing one of the ingredients they use just isn't for me and my skin. I know lots of people love their products though so I guess I'm in the minority! Okay so I think you all know by now that I'm a total lipstick junkie. I've lost count of how many I own and although I know I have far more than one person could ever use, there's something about them that just draws me in. I think its the pretty colours, various finishes and the way a slick of lipstick can make me feel 'done' and ready to face the day. Yep, its a love affair. 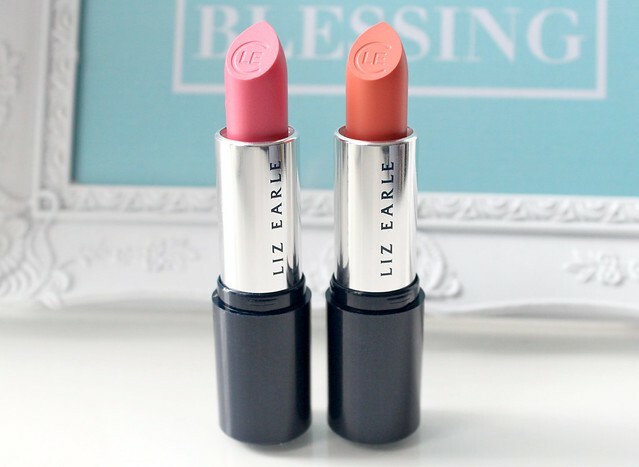 Anyway, these two Signature Lip Colour lipsticks* from Liz Earle have been added to my well-loved stash and have quite quickly made their way to the my favourites pile. They're quite unlike any lipsticks I've tried before as they're pretty sheer and take a few coats to get a pigmented look. However, that's what I love about them. They look so natural which is perfect for the S/S months when I want my makeup to look radiant and fresh. They also make my lips look really plump and feel really soft due to the hydrating ingredients vitamin E, avocado oil and shea butter. The two shades I've got are also perfect for this time of year and definitely make for great every day wear. Peony is a beautiful rose pink and Melon is a gorgeous muted coral. 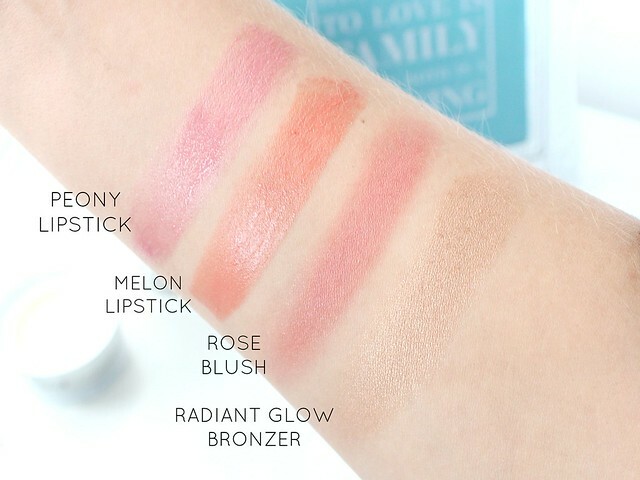 As you can see on my swatches at the bottom of this post, they do have nice colour pay-off but they're sheer enough to layer on and wear on a day to day basis without looking over done! I really really really love these lipsticks and they've been my go-to every single day for the past few weeks! As well as the lipsticks, I've also been loving the Radiant Glow Bronzer and Healthy Glow Powder blush as they both add such a beautiful glow and radiance to my skin which again is perfect for this time of year when I want my skin to look sunkissed, healthy and glowing! The bronzer is a combination of four different shades and when swirled together on a big fluffy brush and applied to the areas of my face than would naturally catch the sun (cheekbones, nose and forehead), it adds a beautiful luminosity to my skin. It isn't glittery at all but it does have a slight metallic/pearlised finish meaning it isn't great for contouring with but perfect for bronzing and highlighting. 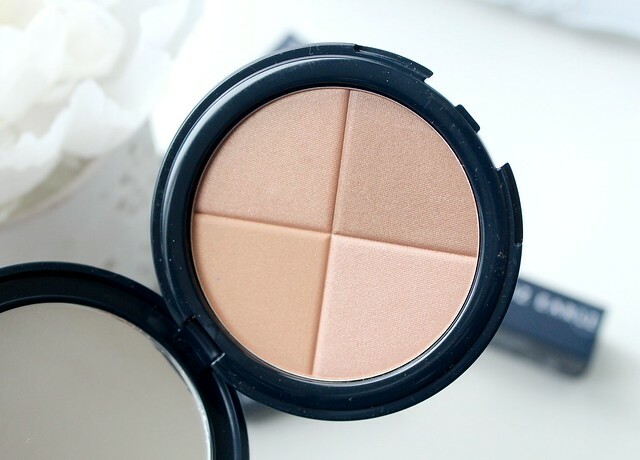 I've been using it in conjuction with my NARS Laguna bronzer and together they're the perfect pair for sunkissed, healthy and radiant looking skin! Continuing with the radiant theme, the Healthy Glow powder blush, which I have in the shade 'Rose', is again perfect for making my skin look healthy and fresh. Its a very finely milled powder, much like the bronzer and its pigmented without being too pigmented, if that makes sense? Like the lipsticks, it has quite a sheer finish but the colour intensity can be built up as desired. The shade Rose is a beautiful rose pink shade (its like the blush version of the 'Peony' lipstick) and it adds a beautiful natural glow to my cheeks - like I've been been outside in the cold and my skin looks flushed. It has what I'd describe as a 'satin' finish as it doesn't contain any shimmer but it isn't matte either - I'd probably describe it as a healthy sheen. Its also very easy to apply and due to the sheer formula snd there's no risk of looking like coco the clown if you're a bit heavy handed. As with all of these Liz Earle products, its absolutely fool proof and I think it would suit all skin tones! I have to say, I'm highly impressed with Liz Earle's makeup range and I'd love to try more of the products in different shades. I think they're very high quality, well presented and they do exactly what they promise. I've been using this combo of products none stop recently and I think they're all beautiful for the S/S months. If you want to freshen up for complexion for Spring, I can't recommend these products enough! I imagine I'll be getting lots of use out of them all over the next few months! 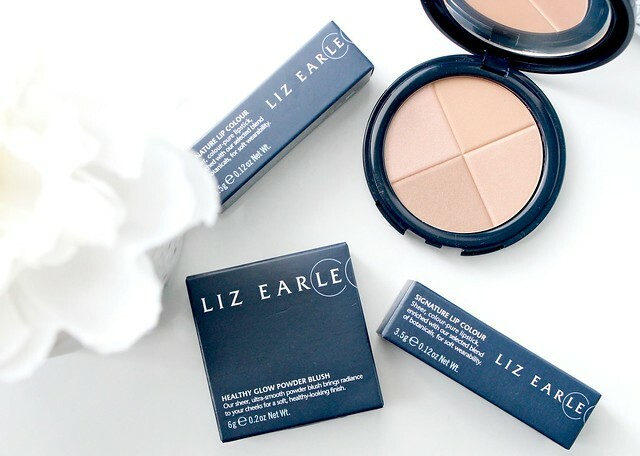 Have you tried Liz Earle makeup? Do you like the look of these products? 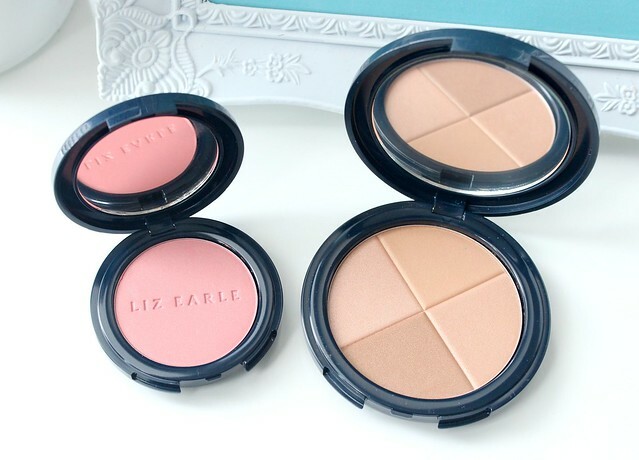 I'm a huge fan of Liz Earle makeup as I was recently sent quite a few bits to try including the two lipsticks you have here and the blush in a different shade. I really recommend the sheer skin tint, signature foundation and smudge proof mascara too! The bronzer is absolutely beautiful and definitely one that I want to get my hands on! I have never tried any of the Liz Earle skin care or makeup but It looks like the company has some beautiful products! 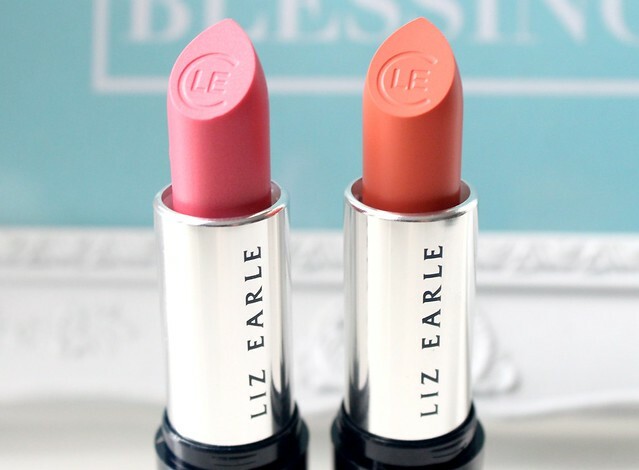 Never even thought of Liz Earle makeup products but they look amazing, especially the coral lipstick. I'd love to try that. I absolutely LOVE the look of those blushes. The radiant glow bronzer seems to have a MAC MSF 'Soft and Gentle' vibe to it, nice! These do look lovely, but I can't help thinking they are slightly overpriced for what they are! The melon lipstick is absolutely divine! I love the engraving they lipsticks have. I have the Lancome lipsticks and they are also engraved which I love. 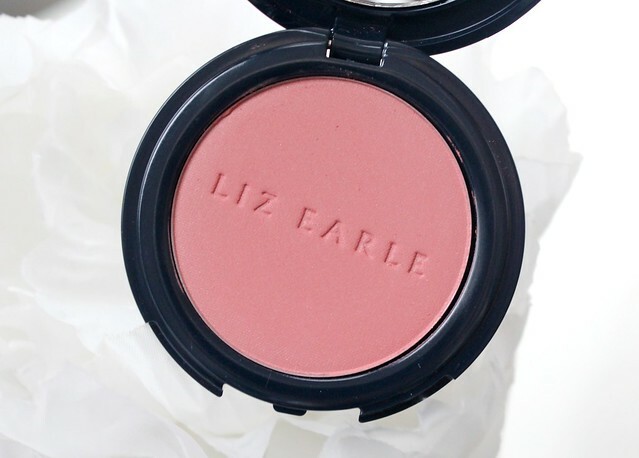 I've never tried Liz Earle make up, but after this I am SOLD. I have one Liz Earle lipstick which I love but also on the sheer/build up side. 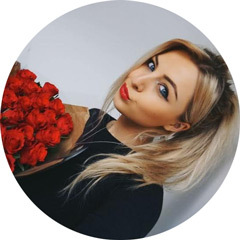 your posts are beautiful! these products look beautiful! So much Spring goodness, it all looks amazing but I think the lipcolours look perfect. So gorgeous! Ive never used any of this range but that bronzer looks amazing! 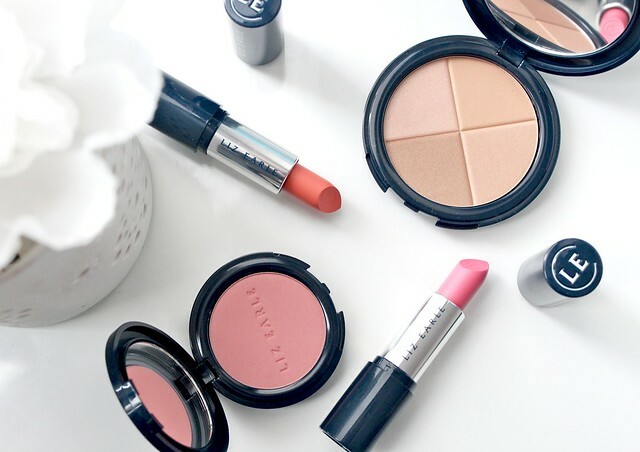 These products look so good - I love the lipsticks! I might need to make a cheeky purchase!